I marvel over and over again how grown up my little boy is becoming! I can carry on regular conversations with him–we have some great ones before he goes to sleep most nights. When he’s not teasing his sister, he’s taking care of her, teaching her how to do things and telling her to eat her food. Just now, I was amazed as I heard him in the next room over getting out a complicated board game, setting it up completely and then coaching Little E through an entire game until they finished it together–and they played it according to the rules, too! I have trouble getting Little E to play that game right. I set out his clothes, but when he’s not resisting, he can get all his clothes on correctly with no problem–something I thought would never happen! He still resists new foods, but so much less than before that we don’t hardly consider it a problem at all. He’s become obedient, organized, considerate, and sweet, and I’m so happy he’s our little boy! 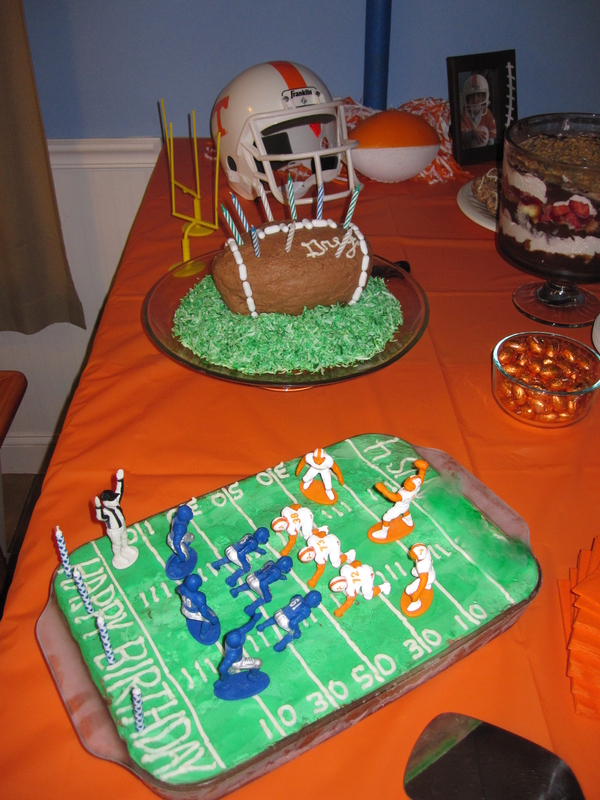 To celebrate his fourth and Greg’s thirty-ninth birthdays, I threw them both a football party–Mr. C’s choice, of course. I dressed the kids up in football/cheerleader outfits and asked the guests to come in football related outfits, as well. 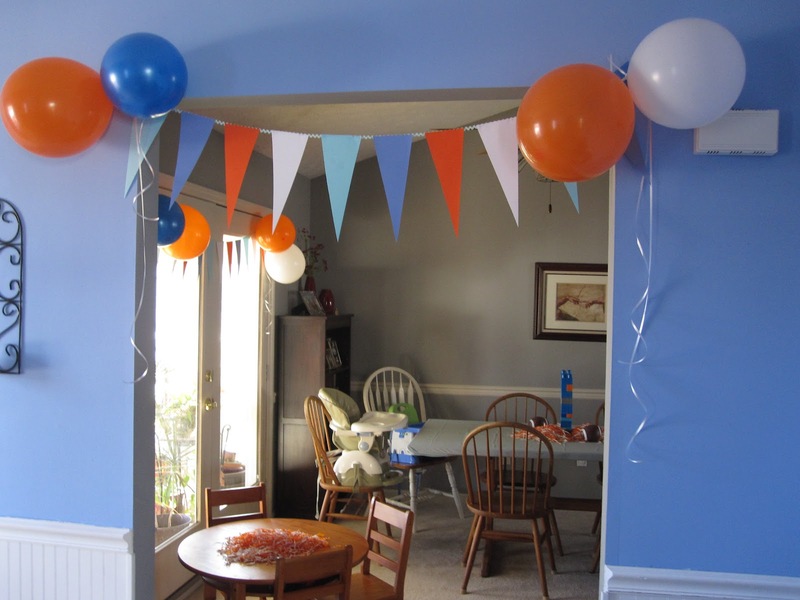 I had to decorate using the color blue, since it’s by far Mr. C’s favorite color, so I chose blue, light blue, white, and orange, taking care not to match any of UT’s rival team’s colors. 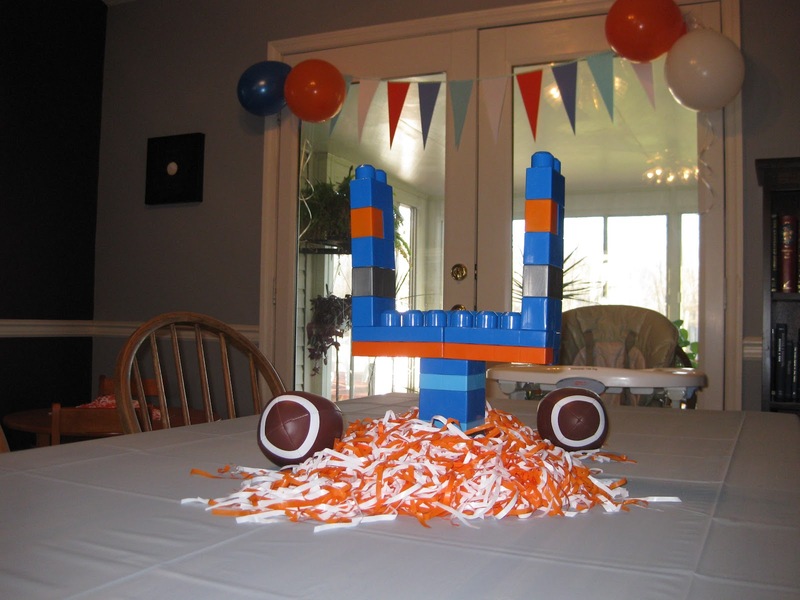 Duplos made a great goal post. Flag banners were easy to make with paper and ribbon. I didn’t take any pictures, but I had coloring pages for the kids inside, and I set out an obstacle course outside for the kids to run through–we stayed out for no longer than thirty minutes, as it was freezing, and the sun was going down. That’s the problem with a February birthday! I drew black lines under the boys’ eyes with face paint as they came in, and my mom drew hearts on the girls’ cheeks. The adults also later played football pictionary on our little chalkboard, which was pretty fun! 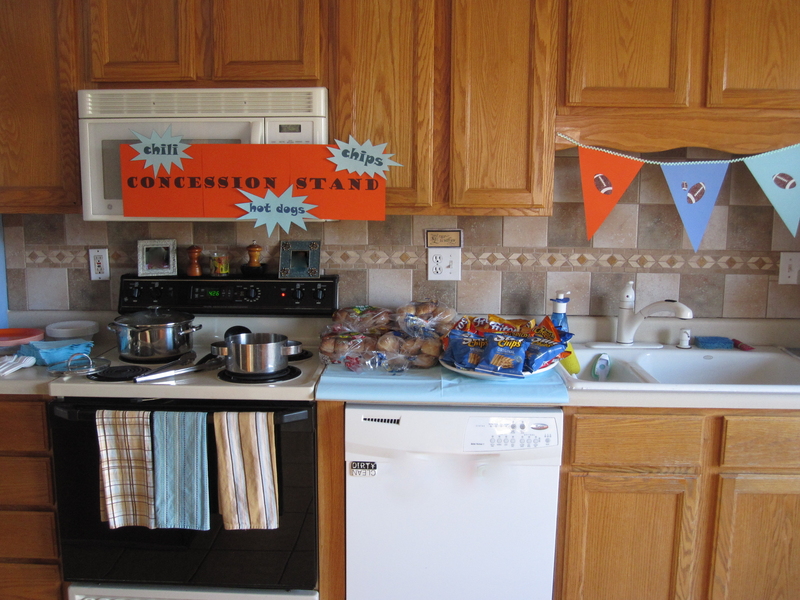 Of course, we had to have food and drinks you might find in a football stadium concession stand, so I served hot dogs, chili, chips, fruit salad (for variety), water bottles, and blue and orange Gatorade, along with orange Capri-Sun for the kids. 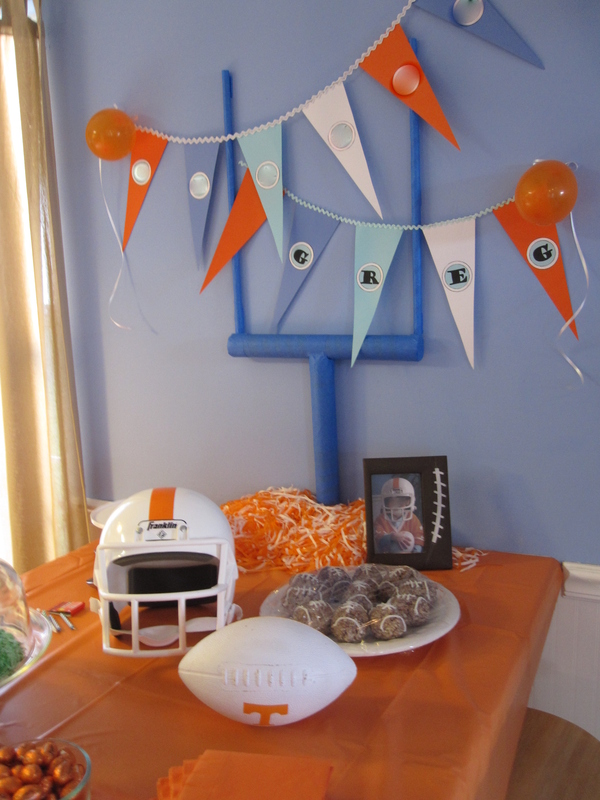 My mom and I made a goal post out of an old wrapping paper roll and two plastic sticks I had, wrapped in blue painter’s tape. 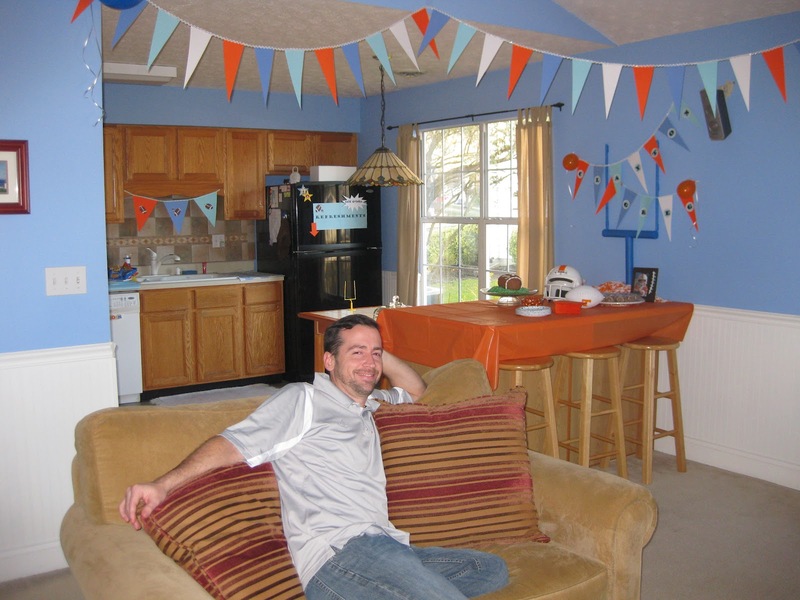 I got some of my decorating ideas from here, and the woman who planned and decorated for that party did a much better job than I did! 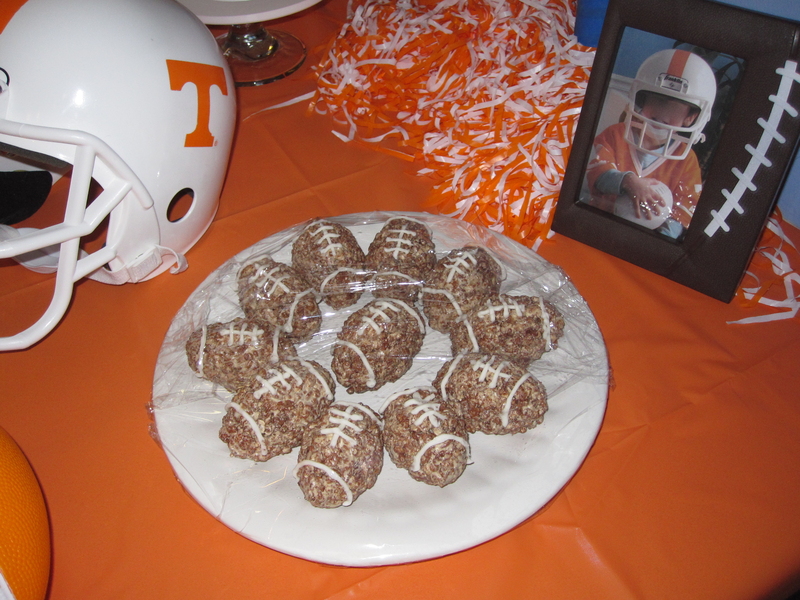 For desserts, I had rice crispy treat footballs (an idea I got from Kellogg’s around Superbowl time), a chocolate trifle my mom made, and foil wrapped chocolate footballs. Of course, I had to have cake! 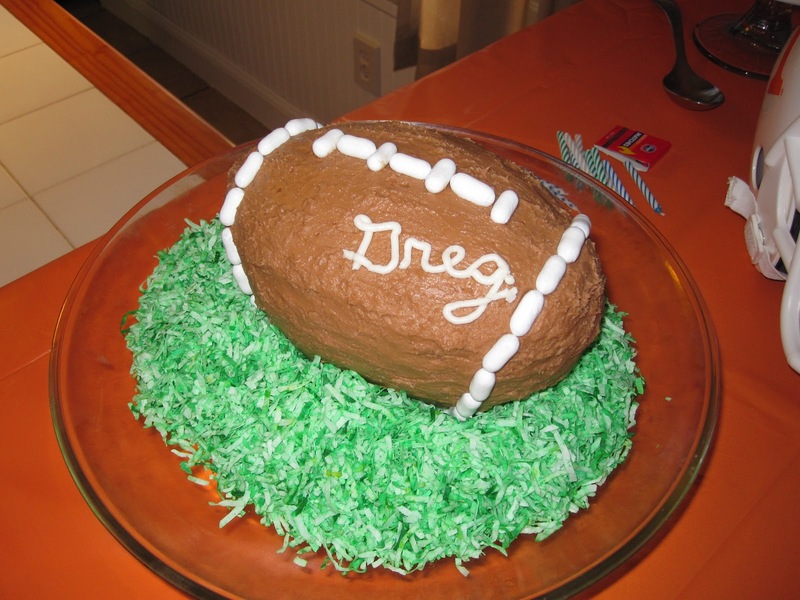 Here’s Greg’s football cake, made from carved pound cake and iced with chocolate icing. The grass was dyed coconut. The cake instructions were on Parenting.com, although their grass looked better than mine. Mine just looked like iceberg lettuce! I also made an ice cream cake for Mr. C with his football guys on top. He did NOT like me using his favorite football guys! He didn’t seem to mind the players being on top of the cake when he got to eat it, though! The best part of the night was being able to spend time with all our friends!